Decades after Brown vs. Board of Education educational segregation in America is worse than ever. Only now it’s not just a black-white issue. The worst impacts of segregation are now felt by Latinos. It’s now 2015, and while much has changed in California, much has remained the same. Segregation is no longer based on official policies or law — called de jure segregation — but based on voluntary housing or schooling choices. Still, the Golden State remains the most segregated one in the country for Latino students, according to research from the UCLA’s Civil Rights Project, which studies civil rights issues. California is extreme, Klein acknowledges, but it’s a nationwide trend of “Latinos quietly becoming the most segregated minority population of students in the country.” And this is a problem about which “no one” is apparently talking. This is significant, for sure. But the difference between de facto and de jure segregation matters a great deal here. Because it’s the difference between legal segregation and what are, frankly, personal choices. The reason no one is talking about Latino segregation is because this is not really problem that is exclusive to Hispanics. It is, in fact, more appropriate to see this as an extension of a much bigger problem in American society, the American wealth gap, which also results in increasing disparity in American schools by social class. The reason no one worries too much about the segregation of Latinos is that this is perfectly legal. It’s also a reflection of a more general trend in American society. Suburban parents live mostly in suburbs with other people like them, and so send their children to public schools with other kids like them. Outside of the suburbs, in most major metropolitan areas and in wide swaths of the American South, there are very few professionals sending their children to American public schools. And since the majority of Hispanics, like the majority of blacks, are working class, they mostly attend public school. And those public schools contain very few white people. But this trend, while perhaps unfortunate, is a reflection of a very rational worry on the part of (white) professional adults. It’s really risky to send their kids to schools with a lot of poor people. Because schools with lots of poor student are mostly low performing. And while we might, in magazines like this one, bemoan this, actual consumer magazines reflect the other end of that trend. 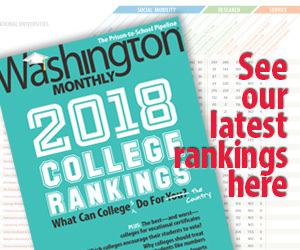 Witness the ever popular U.S. News & World Report annual list of best high schools, based mostly on the percent of students who took and received a good score on Advanced Placement or International Baccalaureate tests. They’re all public, for sure, but after one gets past the first 65 or so high school in America, which are mostly charters or magnet schools, it’s basically a list of the high schools in America’s expensive suburbs. These are schools–Winston Churchill High School in Potomac, Md, Walnut Hills High School in Cincinnati, Ohio, and Blind Brook High School in Rye, N.Y.–with very few poor kids. And that’s why we still have educational segregation in America. How to fix it? Well various pundits have proposed a few ideas. The most effective would probably be to just bus poor people into wealthier suburbs and, yes, bus rich people into poor neighborhoods. But that’s been ruled unconstitutional. In Finland they have basically no private schools, which helps promote equality, for sure. But realistically none of this is going to happen anytime soon. Not without some pretty serious policy changes. So we’re probably stuck with this, unless we get serious about addressing the wealth inequality in America that has created and exacerbated this education inequality by class and race. But other countries don’t have education gaps of this magnitude. This problem is solvable. It’s just not very easy to solve.